Bellissimo... si può copiare questo outfit con davvero pochi soldi, ottimo! Hi Lilli, I have been following the style of Jennifer and her other French Vogue Editors. They are so cool! I'm liking the biker shearling jacket. Splendido questo look e tu sei sempre bravissima a riproporci le tue bellissime scelte in versione low cost!!!!! Montone a parte questo look mi piace tantissimo; bellissimi i pantaloni, sia gli originsli sia le tue proposte. Ciao Lilli. Adoro i colori candidi di questo look e la tua proposta è super carina. Kizzy von Doll... she read my mind! :) I also imagine you wearing this outfit! Lovely look! And a hint of colour of the ring... it's magic! Beautiful title: Portrait ring! I love the boots and their price is friendly! Inspired and inspiring your post, Lilli! Ma che bello questo look, adoro gli stivaletti! I want the jacket! Great job babe! Che bello il giaccone e ottime le tue proposte alternative! The outfit is awesome! I love it! Like the jacket the boots and the ring!! Gorgeous style!! !Have a happy day!Hug! 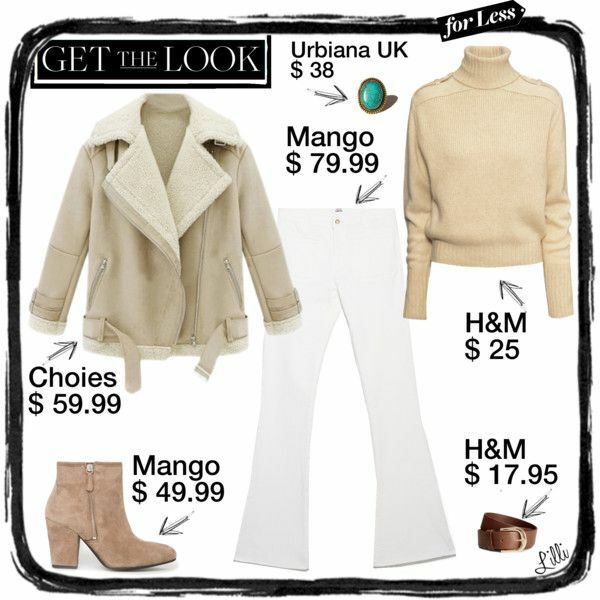 I totally love this seventies inspired look! So classy and stylish. The roll-neck jumper looks so luxurious! Yay Lilli! I have MISSED this budget alternative posts from you. What can I say, I am a broke girl trying to look good so I LOVE these suggestions! LOL! I love the H&M polo sweater, that is such a gorgeous and versatile piece. Love this look, it's causal, minimal but very chic. Good one, Lilli! Semplicemente perfetta! Adoro ogni dettaglio!! I have a similar jacket and I love it! a parte che io amooooo questi cappottini da pastorella...ne ho uno che è una copertina di linus! Lilli, ma sai che quando ho aperto la tua pagina pensavo do aver sbagliato nel vedere la foto di un altra?? Poi ho realizzato, ahahhaa. Comunque tu sei sempre bravissima a trovare le alternative low cost di un bel look. Bravissima!!! This is exactly the style I lile. In general I find white trousers great and also just in winter. Many women do avoid white trousers in winter, I not. The jacketis also a little dream. Lilli I have already said, how much I like your category "copy outfit for less" We does not need to have a lot of money around for a good style. Bellissime le tue proposte alternative! Un bacio Lilli. Great stuff!! :)) I want a jacket like this! E che meraviglia sono questi booties! Lilli sei stata bravissima, il look che hai ricreato è praticamente identico, eccetto per il prezzo ovviamente! Quel maglione di H&M è stupendo, mi sa che devo fare un salto in negozio! Trovo davvero bellissimo sia il look originale sia le tue proposte, in particolare la giacca è bellissima! Molto carino poi quell'anello con il turchese! With a pink or red lipstick I see you with this copy outfit for less proposition, I wouldn't say no for myself either wearing an orange lipstick. You are great in collages, as always you did a nice job! Many kisses and lovely day to you! I always enjoy your 'copy thge outfit' for less posts as you always find alternatives which are spot on. Love this 70s inspired look and this colour combination is a favourite of mine. In fact I have far too much of this camel / beige in my wardrobe at the moment! I'm sure I have a similar ring - I shall have to look for it! Lilli, I got a shock just now as I thought I've gone to the wrong blog. Then after that I thought if you had changed so much that I couldn't recognize you. Silly me. Anyway I can imagine you with this look. It would match every bit of you! I can never find the perfect white pants ever. I wonder how people do it. Have a lovely weekend soon. We are having a long weekend as we are celebrating Chinese New Year here. this girl is just like you - lots of style a gorgeous face and un je ne sais quois trés interessant! love how you always nail he copy looks so prfectly! you'd look super cool in this amazing casual oufit as well! Babe I just loved your last look - the beautiful fur coat, the ruffled skirt, the cozy beanie and the killer make up! top!!! Casca proprio a fagiolo! Il look bianco e cammello è una delle mie recenti ossessioni. Come al solito sei riuscita a selezionare dei pezzi splendidi ad un prezzo davvero ottimo. Grande Lilli! This outfit is so beautiful Lilli! I'm loving creams and whites. Love the shearling! So fabulous. Brava Lilli, questo outfit è bellissimo, con queste nuance chiare che mi piacciono da morire in inverno, e la selezione low cost è perfetta per riprodurlo! !